The NBS National BIM Library is the fastest growing BIM Library in the UK, giving you access to a comprehensive collection of Building Information Modelling (BIM) objects ranging from building fabric systems to mechanical objects and electrical objects. BIM objects are construction product information presented in a 3D format and can be downloaded free of charge. BIM objects in the NBS National BIM Library have been created with the NBS BIM Object Standard, a global standard providing high quality BIM objects by providing a common data set to drive collaboration and consistency. BIM objects can be accessed directly in your design tool using the NBS Plug-ins for Autodesk, Revit and ArchiCAD. 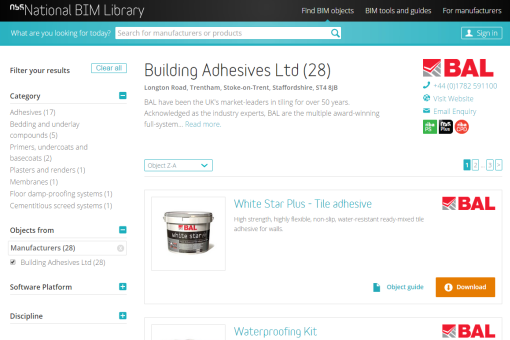 BAL was one of the first adhesive manufacturers to sign up to the NBS National BIM Library. Drag and drop our adhesives, grouts and sealants onto your NBS specification, read NBS product guidance and have ease of access to thousands of BIM objects.